Helly Hansen Huk SS Shirt. 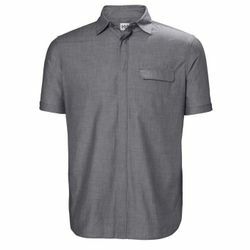 A light, classic, hidden-button, short sleeve, collared shirt. Huk is Oslo's most visited beach in the summertime. The Huk SS has a clean and classic short sleeve design in soft chambre poly/cotton fabric blend. The wicking and UPF properties makes this short sleeved shirt the perfect light option for those warmer summer days. Poly/cotton blend fabric with moisture wicking properties.